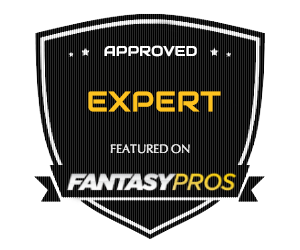 If you’re new to the MFL 10 format (hosted by MyFantasyLeague), it’s really quite simple. Best ball leagues are draft-only with PPR scoring, no waiver claims, no setting line ups, draft and forget essentially. Once a league is filled (12 league mates), you draft 20 players. After completion of the draft, your best team each week will accrue points, until a winner is determined (most points accrued for the season). At the end of the season who ever has the most points wins 100 dollars, while second place gets a “free” entry (10 dollars) for the following season. Higher dollar best ball leagues are available, but the lowest rake (operator fee) is with MFL 10’S. Giving yourself a higher probability of positive ROI (return on investment) is always an important rule to follow. Below I will leave you with some basic strategy, and my optimal number of players per position. Here’s an example of a team I drafted utilizing the above advice.